The FL-1340 and FL-1440 Series has been discontinued. Please see the FL3200, FL3300, FL3400, FL3500 Series as a possible alternative or contact our Flow Engineering department. These rotameters, have heavy wall, precision-bored borosilicate glass metering tubes and are fully shielded against breakage, with end fittings of brass or stainless steel and aluminum side plates. In front, a clear plastic shield keeps the scale clean and easy-to-read, while an opaque white rear shield provides a background to aid in discerning the float position for accurate readings. These rotameters are equipped with horizontal ports with NPT threads for easy panel mounting. The ports have external threads and are equipped with panel retaining nuts. No additional mounting hardware is required. Simply drill two holes 114.3mm (4.5") apart (center to center) for 65mm units or 223.8mm (8 13/16") apart (center to center) for 150mm units. Each hole should be 14.9mm (0.59") in diameter. 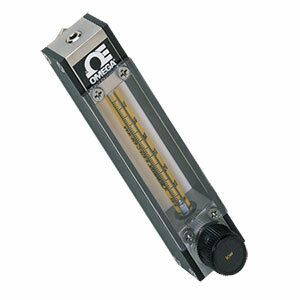 The 150 mm size flowmeters are also available with non-rising stem type needle valves for special applications. This 15-turn metering valve has superior flow rate control and is particularly well suited for use in chromatography applications. The sliding tapered needle mechanism virtually eliminates sticking or buildup due to foreign matter in the fluid stream, without variations or sawtoothing of the flow rate. These compact units feature ±10% of full scale accuracy and ±½% of full scale repeatability. They are ideal for applications involving purging, seal oil systems, bearing lubrication, and cooling water flow indication. OMEGA's larger units feature 5% accuracy and ¼% repeatability. The scale has more divisions for higher accuracy, is easier to read, and causes less eye fatigue. Variable area rotameters can be used in many applications, including industrial and laboratory situations. Some common uses include carrier gas flow and fuel flow in chromatography and coolant flow indication. Control the flow rate with the standard built-in control valve. Also available, as an option, is an integral flow controller. In addition, 150 mm scale units are available with the unique non-rising stem type needle valve. Standard floats are 316 stainless steel, glass, and carboloy. Other wetted parts include the glass mtering tube, PTFE float stops, brass, aluminum, or 316 SS end fittings, and Buna (with brass or aluminum construction) or FKM-A (with 316 SS construction) O-rings. The maximum operating pressure is 13.8 bar (200 psig), at temperatures up to 121°C (250°F). The minimum flow rate at the rated accuracy is 10% of the maximum flow rate. All connections are 1/8" female NPT threaded. Minimum flowrate is 10% of the maximum rate shown. 3.Low cost, stainless steel construction unit with 65 mm glass tube also available. Rotameter 3800 Air cc/min, 84.6 Water cc/min. Rotameter 7600 Air cc/min, 218 Water cc/min. 참고: Comes complete with correlation tables for air and water and operator's manual. For a glass float, add suffix "-G". For a 316SS float, add suffix "-S". For a carboloy float, add suffix "-C".